Although he was drafted into the army in 1945, World War II ended soon after and he never went abroad. He left the military and studied at Oxford, where he was enamored with the works of French existentialists. He saw in the writings of Albert Camus and Jean-Paul Sartre a similarity to his own ideas regarding conformity and the individual. Fowles graduated in 1950 with a degree in French. While he dreamed of becoming a writer, Fowles first supported himself by teaching. He spent a year lecturing on English literature at the University of Poitiers followed by two years teaching English at Anargyrios College in Greece. He finally found steady occupation at St. Godric’s College, London where he taught English from 1954 to 1963. Fowles first began writing during his time in Greece, mainly composing poetry. During the 1950s he produced several novels but was dissatisfied with them all. Then in 1960, Fowles wrote a draft of his novel, The Collector, in one month. He spent the following two years on revisions and in 1963, it was published to immediate success. With the financial and critical success of his book, Fowles left his teaching position and began to write full time. 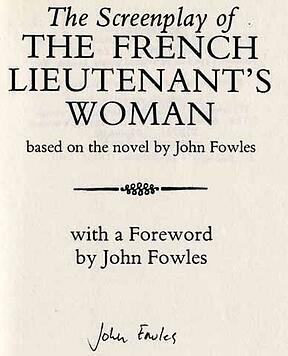 Fowles’ most successful novel, The French Lieutenant’s Woman, was published in 1969. Although Victorian in structure, the book was postmodern in content—challenging typical approaches to narratives and criticizing traditional gender roles. In a description of the book in their obituary for Fowles, the BBC said "It was a new kind of historical novel, with layers of truth, fantasy and self-awareness." Playwright Harold Pinter adapted the novel into the successful 1981 film starring Meryl Streep and Jeremy Irons. The film earned five academy award nominations and Pinter won a Golden Globe for his screenplay. Fowles himself believed that only Pinter would be able to adapt his novel for the screen. He said Pinter had the great skill of "reducing the long and complex without distortion. " (from the cover). Fowles enjoyed greater critical and popular acclaim in the United States than in his native country. While in America his books were included in college literature classes and reviewed warmly, the British establishment never fully embraced his work. He once quipped, "I don't think the English like me. I sold a colossal best seller in America, and they never really forgave me." Fowles lived in near seclusion during the end of his life and died on November 5, 2005. "I know I have a reputation as a cantankerous man of letters and I don't try and play it down. A writer, more-or-less living on his own, will be persecuted by his readers. They want to see you and talk to you. And they don't realize that very often that gets on one's nerves." 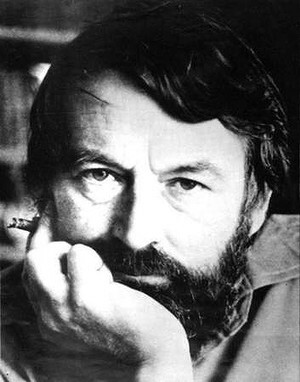 In honor of John Fowles' birthday, we encourage you to pick up a copy of one of his many successful works or view one of the film adaptions. You won't be disappointed.